Want a Hanukkah dessert that doesn't involve deep-frying and jelly-filling yeast-raised dough? These chocolate gelt thumbprint cookies are proof that sufganiyot (jelly donuts) aren't the only festive dessert in town! Oats and cinnamon enhance the easy-to-prepare cookie dough, which makes a delicious frame for the candy coins. When the holiday is over, you can use the same recipe to make traditional jam thumbprints, or even plain oat cookies. Should you add the chocolate before or after you bake the cookies? The answer depends on the coins you choose. 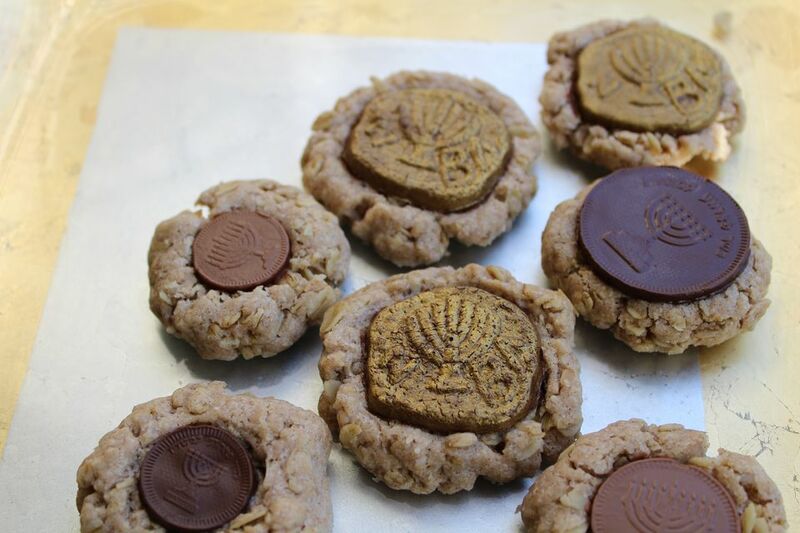 If your gelt has embossed images (say, of a chanukiyah), pressing the gelt onto the cookies after baking helps ensure the embossed pictures on the coins remain visible. That's especially true if you're using milk chocolate coins, which melt more quickly while baking. However, the cookies are a little more prone to crumbling if you add the chocolate after they're baked. Take care to add apply light, even pressure while pressing the gelt onto the cookies to prevent breaking the cookies or coins. Preheat the oven to 350 F. Line 2 large baking sheets with parchment paper or silicone liners. In a large bowl, whisk together the flour, oats, cinnamon, and salt. Set aside. In another large bowl, or using a stand mixer, cream together the sugar and butter or coconut oil. Add the oil, egg, and vanilla extract and beat until smooth. Add the flour-oat mixture to the wet ingredients and mix well to fully incorporate the dry ingredients. Break off walnut-sized pieces of dough and roll them into balls between your hands. Flatten slightly into discs, and place on the prepared cookie sheets. Bake for 12 to 14 minutes, or until the cookies are set, the surfaces are dry and the bottoms are slightly golden. Let the cookies cool for 1 to 2 minutes more, then use a spatula to transfer them to a rack to cool completely.